Animal Shelter Report: Calling all Siberian husky lovers! “Balto” is a stunningly handsome cream and gray three-year-old husky who is as sweet as he is easy on the eyes. Huskies were originally bred in Siberia, and put to work as sled dogs. However, they can also excel as pets. Huskies are known for their friendliness for their families, children, other dogs and even strangers. They are high energy, playful dogs, but can have a wanderlust potential. While Balto certainly has all the good qualities, he also likes to roam given the chance. He can sail over short fences, so will need a sturdy six-foot or higher fence. He will chase chickens and probably livestock, as well as cats — again the need for a fully fenced yard. Balto is a real love bug who would thrive in a home with kids, but would also be a great companion for a single person. His adoption fee is only $125, so if you are a “husky savvy” person interested in adopting this sweet boy, come and meet him! Recently, a local woman suffered some health issues that lead to her having to surrender her beloved cats to our shelter. Thirteen of the cats were surrendered, and they are all friendly, healthy, beautiful kitties. It is obvious the woman cared for them. Some of the kitties are very exotic looking. 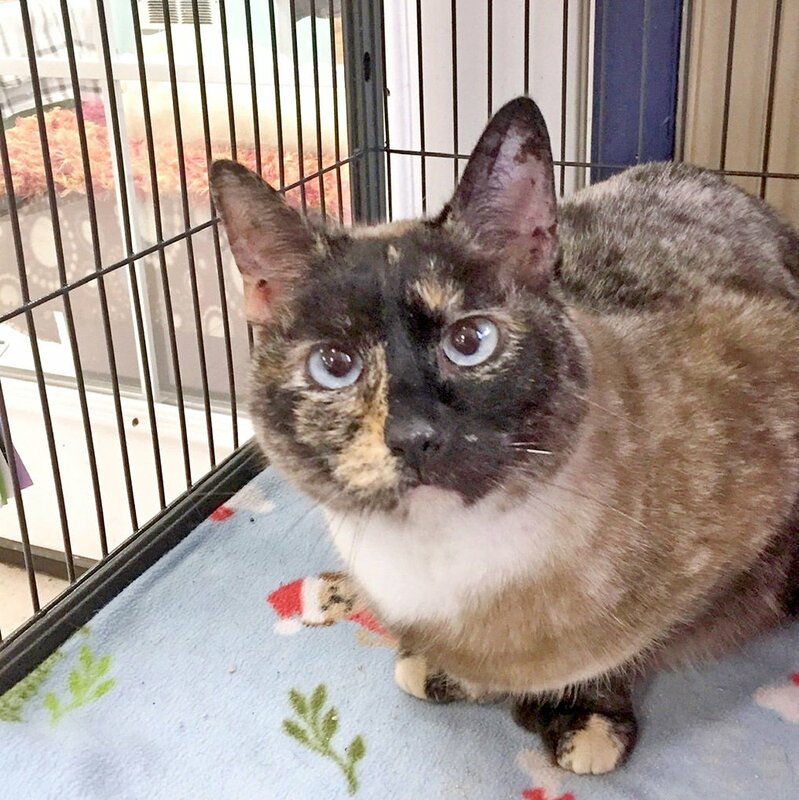 “Monkey” is a tortie point Siamese mix with a pretty multi-colored coat and striking blue eyes. In addition, as if these qualities are not enough, she is also polydactyl, meaning she has multiple toes!. Her buddy in their tower cage in the lobby is “Bernie” a lynx point mix with beautiful coloring gorgeous blue eyes. Both these kitties are very “chill” and get along with other cats. These two wonderful kitties are just a few of the beautiful cats who sadly lost their home but are hoping you have room in your hearts for them. Come in and take some time to meet them. These guys are going to make great pets again if only given the chance. We are having this important fundraiser this Saturday, April 13, at the Peninsula Senior Center, 21603 O Lane, Klipsan Beach. The event will feature a silent auction, cash bar, great lasagna dinner and music with DJ Barnes. The party will run from 5 p.m. to 9 p.m., with dinner service beginning at 5:30 p.m. Tickets are only $25, and one adult beverage is included in the ticket price. Purchase tickets at: charityauction.bid/BeachPetsBash! or at the shelter 330 2nd St NE, Long Beach. Adoptions require approval of an adoption application. Applications are available at beachpets.com. Email the completed form to spchs330@gmail.com. Prospective adopters can also fill out an application at the shelter. SPCHS Shelter is at 330 Second St. NE, Long Beach, WA 98631 (P.O. Box 101) 642-1180. Thursday hours are 11 a.m. to 6 p.m. Hours on other days are 11 a.m. to 4 p.m. on Tuesday, Wednesday, Friday and Saturday.